It turns out Tito Ortiz is coming out of retirement and he will fight a fellow former UFC champ, but it won't be in the UFC. During Wednesday night's Bellator card, Quinton "Rampage" Jackson announced he will fight Ortiz at Bellator's first pay-per-view. The fight will happen Nov. 2. Both fighters were UFC champions, and both are riding a three-fight losing streak. Ortiz retired after losing to Forrest Griffin in 2012. Nearly his entire career was in the UFC, and he was the light heavyweight champion from 2000-2003. He often battled with UFC president Dana White, and Ortiz said that broke him. “Over the last few years, my passion for MMA was completely killed, dealing with UFC politics and with Dana," Ortiz said via press release. "I didn’t have that drive to compete, my heart wasn’t in it. I feel like a huge weight has been lifted off my shoulders." Jackson left the UFC after his contract ran out and he was not happy with the way he was treated by the promotion. “Honestly, I feel like I’ve been re-born,” Jackson said. “My excitement, energy and aggression, it’s all back and bigger than ever. I feel like a kid again. 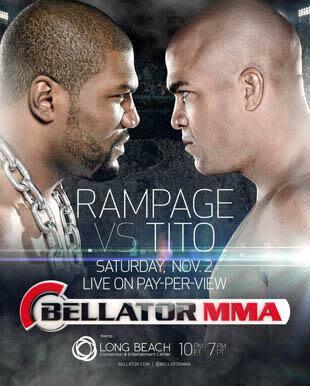 The Rampage you’ll see Nov. 2nd will be better than any Rampage you’ve ever seen." Both fighters are big names with a large fanbase, but pay-per-views can be a tough sell. As of today, the UFC doesn't have any events scheduled, but that could change. Will you shell out the money to see these two fight? Speak up on Facebook or Twitter.